We've all seen that famous New Yorker cover satirizing a New Yorker's distorted, self-centered view of the world: Manhattan occupies a good half of the image, relegating the rest of America (and indeed the world) to the status of outer-outer boroughs. What Saul Steinberg did with a drawing in 1976, pioneering Roman geographer Pomponius Mela had done, in a much less comedic but much more accurate way, with text nineteen centuries before. Writing from his perspective under the reign of the Emperor Gaius, Claudius, or both, Mela created nothing less than a worldview, which tells us now how the ancient Romans conceived of the world around them, its characteristics and its relationship to the territory of the mightiest empire going. "Pomponius Mela is a puzzle, and so is his one known work, The Chorography," writes Frank E. Romer in Pomponius Mela's Description of the World. In that series of three books, which seems not to have contained any maps itself, Mela divides the Earth into two rough "hemispheres" and five zones, two of them cold, one of them hot, and two in between. Pulling together what in his day constituted a wealth of geographical knowledge from a variety of previous sources, he painted a word-picture of the world more accurate, on the whole, than any written down before. Scholars since have also praised Mela's clear, accessible prose style — clear and accessible, in any case, for a first-century text composed in Latin. Various maps, including the 1898 reproduction pictured at the top of the post (see it in a larger format here), have attempted to visualize Mela's worldview and make it legible at a glance. 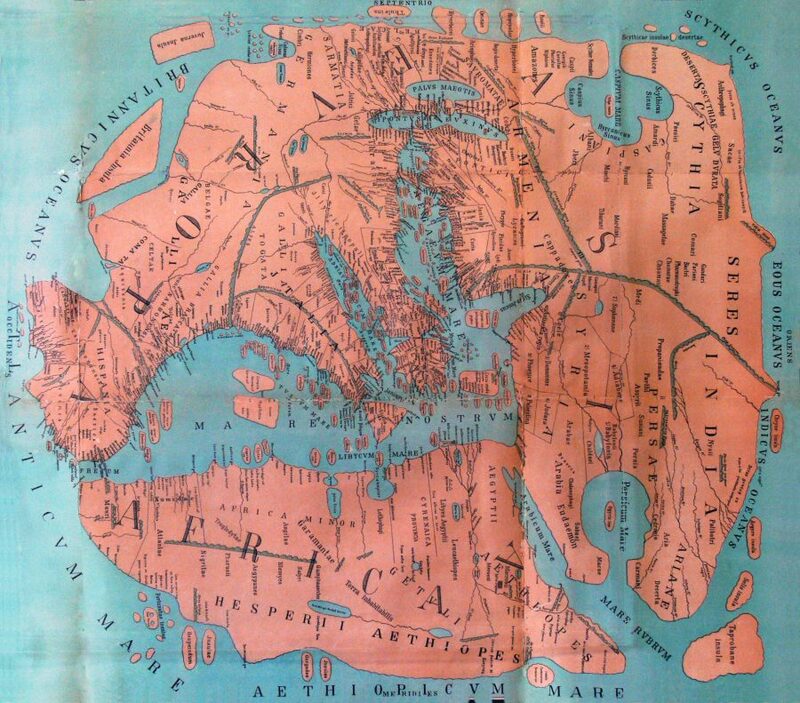 You can see more versions at Cartographic-images.net, and the David Rumsey Map Collection shows the world according to Mela placed alongside the world according to Ptolemy and the world according to Dionysius Periegetes. Though Mela showed greater insight into the integration of the various parts of the world known to the ancient Romans than did his predecessors, he also, of course, had his blind spots and rough areas, including the assumption that human beings could only live in the two most temperate of the climatic zones he defined. Even so, the maps derived from his work provide an informative glimpse of how, exactly, Romans saw their place in the world — or rather how, exactly, they saw their place in the center of it. The real discussion is how this ethno-centric view of “the known world” is not unique, but a characteristic of humans in general. The Chinese historically & cosmologically believed themselves to be the center of all things, and this informed their society, culture and policy. Same with many, many peoples and their cultures. It’s the building & embracing of a construct of “existence” that provides many solaces and justifications. I would argue this continues today with much religious ideology as well as secular groups. To dig down a bit, the “view from the center of it all” starts from childhood. Do we grow out of that?